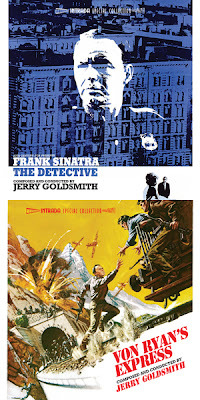 Following Intrada's previous Jerry Goldsmith double-header from 20th Century Fox, Shock Treatment/Fate is the Hunter, Intrada now presents Von Ryan's Express/The Detective. Up first on this sparkling release is one of Goldsmith’s grittier scores -- The Detective. Frank Sinatra stars as Joe Leland, a wised-up but honest New York City cop freighted with problems both personal and professional. The case he’s working is particularly nasty: the gay son of a city bigwig has been found murdered, and Joe must deal with the grotesque homophobia of his fellow cops, the just-wrap-it-up attitude of his boss, and the too-easily obtained confession of a deeply damaged psychotic. Goldsmith attacks this lurid material with intelligence and restraint, beginning with a main title theme that displays superb muscularity: soaring trumpet, layered with a dirty, buzzing guitar line and crying strings. Sinatra also stars in Von Ryan's Express, playing Colonel Joe Ryan, an American flyer who, after being shot down in Italy, suddenly finds himself the highest ranking officer at a miserable prison camp. This does not sit well with his mostly British fellow prisoners, particularly when Ryan shows more interest in taking care of the ragged, malaria-plagued detainees than in making what he considers futile attempts to escape. But when choice opportunity presents itself, Ryan initiates a daring mass escape by hijacking a train and fleeing with his troops through German-occupied Italy. Composer Goldsmith's sparse score adds striking color to the film, with suspense, comedy, and sheer drama. Goldsmith signatures are everywhere: the combination of racing piano and low strings, the electronic decorations melded with pizzicato strings, heartbeat percussion and insinuating vibes, the trumpet-led variation on a theme, the sprightly recurring march and its triumphant if wistful restatement at the end. All packed into a tight 26-minute score. With a couple of exceptions in Von Ryan's Express, both scores are presented in stereo from the original elements stored at 20th Century Fox and debut in complete form.